Vikes Win 2nd Straight County Title! Posted on February 20, 2011 by Dona | Comments Off on Vikes Win 2nd Straight County Title! 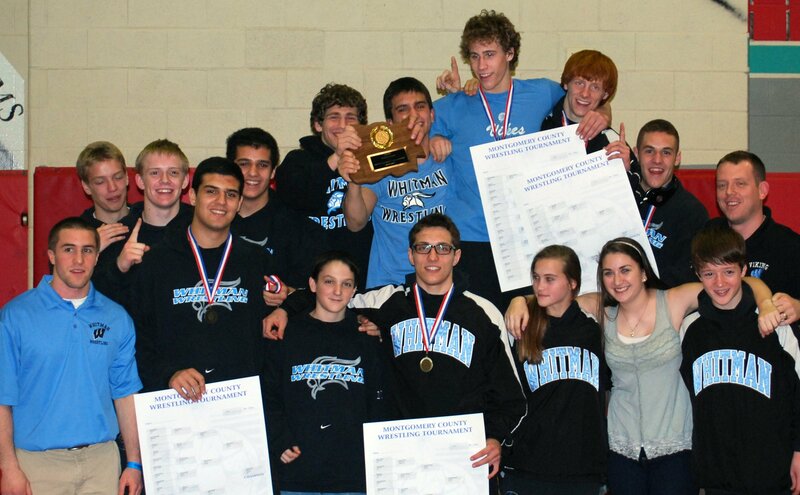 The Whitman wrestling team put together an impressive performance this weekend to capture the 2011 Montgomery County Tournament crown. The Vikes won by nearly 30 points over 2nd place team Magruder. Wootton and B-CC were the 3rd and 4th place teams respectively. The Viking’s tournament was highlighted by 5 finalists and 4 champs in their weight classes. Leading off the finals for the Vikings was Senior captain Eric Harder at 130 pounds. Eric won a close decision over Shane Bramble of Wootton. Two matches later, Senior Captain Mike Harder was a winner by Fall of Tommy Broussard of Rockville at 140 lbs. That was Mike’s second consecutive County title. Only two more matches later Senior Andrew Follmann won the 152 lb class with an impressive win over Garrett Hoover of Paint Branch. That win avenged an earlier loss this season to Hoover. Once again the Vikes were on the mat two matches later for Brad Taylor in the 171 lb final. Brad had a terrific tournament and had a great finals match in which he came up just short against Greg Potemken of Wootton. Brad was the #6 seed and beat the #3 and #2 to earn his ticket to the finals. Finally, Senior Captain Ned Daryoush capped off an amazing tournament for Whitman with a pin of Springbrooks Churchill Ndonwie in 35 seconds. This was also Ned’s second consecutive County Title. The only other placer Whitman had was 215 pounder Josh Daryoush. Josh took 3rd place wrestling aggressively in all of his matches to earn the bronze medal. Other wrestlers to earn victories were Harriet Symington, Will Bouten, Alex Hysong and Max Sessions. Congratulations on a terrific tournament to all Whitman Wrestlers! This entry was posted in Tournaments and tagged county tournament champs. Bookmark the permalink.